Official engine configuration tool used by Square Enix. Luminous Engine Graphics Configuration Tool is an official application created by Square Enix that was shipped alongside Steam demo version of the game. It allows you to configure the game externally both above and below limits of ingame presets (plus allows you to use some hidden settings). Drop both folders to your main game installation folder. The application is located in "tools\GraphicsConfigurationTool" subfolder (file tree is mandatory, otherwise application will not start!). Settings created with the tool are written to GraphicsConfig.ini in main game folder and override one in my documents folder. To make the game load your default settings file from My Documents folder you need to remove the one from main game folder. Also bear in mind that adding custom commands to default GraphicsConfig.ini does not work as the game doesn't read all commands from it. Also adding custom commands to GraphicsConfig.ini in main game folder without having the tool present may cause the game to crash. Please note this tool is OLD, it does not accurately reflect all options available in current version of Luminous Engine/FFXV, some settings are moved or missing in the game and some settings have been added but this tool does not have them. Additionally GraphicsConfig.ini located in main folder allows you to add commands from THIS(CLICK) list. Display resolution (lists only 16:9 resolutions) - Game window/final screen size. Rendering resolution (lists only 16:9 resolutions) - Actual amount of pixels rendered by the game which are later fit to display resolution. Maximum framerate - Self explanatory. FPS visibility - Shows an overlay with current FPS and resource usage in top left corner of the screen. Configuration visibility - Shows an overlay with current settings overview below FPS overlay. Wait VSYNC - Enable/disable vertical sync. Hardware fullscreen mode - Enable/disable exclusive fullscreen (off = borderless windowed). Fullscreen mode on startup - If enabled, go to either borderless or exclusive full screen. FP16 backbuffer - Half precision floating point operations for back buffer, potentially greater performance at no visible loss in image quality(game will crash if your GPU doesn't support it). Display mode when not aspect 16:9 - Enable/disable letterboxing for non 16:9 resolutions (ZoomEven breaks menu and popup displays). 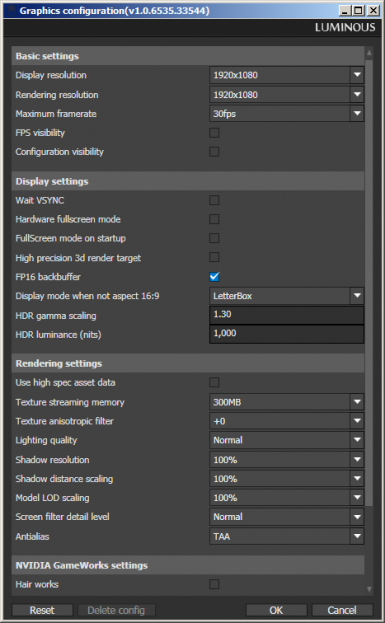 HDR Gama scaling - Default brightness in HDR mode. HDR Luminance (nits) - Maximum luminance in HDR mode. Use high spec asset data - Higher grass density + usage of high res DLC if installed. Texture streaming memory - Amount of memory preallocated to textures (values aren't really suited for actual game). Texture anisotropic filter - Anisotropic filter setting, allows up to 16x while game maxes out at 8x. Shadow resolution - Percentage factor of default shadow resolution, values above 600% tend to be less stable. Shadow distance scaling - Adjusts shadow coverage distance scaling, higher value = greater shadow distance but less precision (and vice versa). Model LOD Scaling - Mesh LOD distance bias percentage, higher = models retain higher quality at greater distances. Screen filter detail level - Determines quality of post processing filters. Antialias - Set postprocessing antialiasing to off/FXAA/Temporal. Turf - Enable/Disable Turf effects. Shadow Libs - Enable/Disable NVIDIA HFTS. Flow - Enable/Disable NVIDIA Flow. Terrain Tesselation - Deprecated, retail version moved this setting to different group (read: it does nothing).